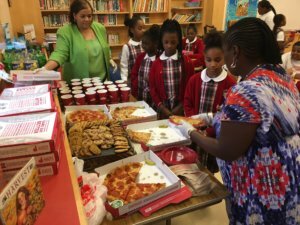 A hurricane-stricken Puerto Rican and a local fan who dropped off pizza are among the admirers of a video of the choir from Cardinal Shehan School in Baltimore that as of Oct. 18 had been clicked on more than 20 million times. The viral sensation, which only figures to grow after an appearance on ABC’s “Good Morning America,” is the result of Kenyatta Hardison’s quick thinking and the talent of the children at the Partners in Excellence School on the campus of St. Matthew Parish in Northwood. Benefactors of the Archdiocese of Baltimore saw two of her students, John Paige and Kai Young, perform a Gospel rendition of the Andra Day song “Rise Up” at a PIE breakfast Sept. 6. Nearly 1,000 saw them and fellow Cardinal Shehan students anchor an archdiocesan Catholic Schools Choir Sept. 30 in another uplifting performance of the song. That Gala was the day before the anniversary of the death of Hardison’s mother, Sylvia, who had taught music at the former St. Mary of the Assumption School in Govans. With her mother in mind as her students prepped for the Gala, Hardison asked them to give a little more in rehearsal, began recording a video on her phone and sharing it on Facebook live. “We had a little talk about being a gift-giver, to make sure they knew what the song (Rise Up) was about. And then my phone just kept going off. I actually had to reboot it; it was getting stuck,” Hardison said, of all the Facebook notifications that were overloading her phone. After ChoirBuzz shared it on Facebook, the video gained further traction, from as far away as Argentina, and most challengingly, from Puerto Rico, where one fan remarked that the singing of the students helped them manage the travail of Hurricane Maria. Hardison understood, as her students have moved her in the same way. Paige, fellow sixth-grader Young, Carlyse Blackwell and fourth-grader Bryana Hardison, Kenyatta’s daughter, are featured in the video. 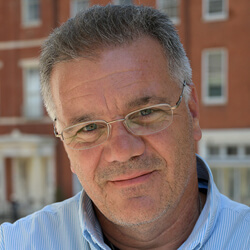 Hardison, who is also minister of music at Historic St. Francis Xavier Parish, attended parish schools at the since-closed St. Katharine of Siena and Most Precious Blood. After graduating from The Catholic University of America in Washington, D.C. with a degree in music education 23 years ago, Hardison joined the staff of Cardinal Shehan School, where the principal is Fametta Jackson, and never left. She has been overwhelmed by the response, which includes fans who have incorporated it into their workout music; to Mel Ledbetter, a Pikesville realtor who brought by pizza for the choir Oct. 12; to a monetary donation to the school on behalf of a fan who said it “brought a smile” to the face of his bedridden father. Hardison has fielded media queries from USA Today, the Washington Post, Baltimore Sun and CNN. In addition to ABC’s morning show Oct. 20, when the children performed in Times Square, her students have been invited to the lighting of the Center City Christmas Tree in Washington, D.C.
Paul McMullen contributed to this story.